Thanks for all the positive encouragement and comments! The pattern download is through Google Drive. 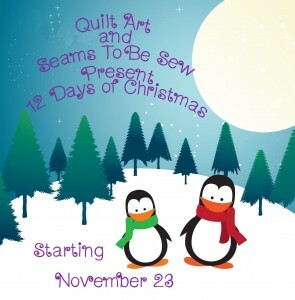 The day #1 - 7 is now on sale and available through Craftsy. I hope you enjoy making or even just collecting all the penguins..
Be sure to also visit Seams to be Sew and see what Marian has for all of you! Her Festive Trees are so sweet and adorable that even I'm going to start making a few. Thank you so much for your wonderful penguins. It really feels like Christmas, each morning a little present from you. I look forward to start making them. He looks so toasty warm. Thank you for the cute designs each day. So Precious,as usual! Thank you!